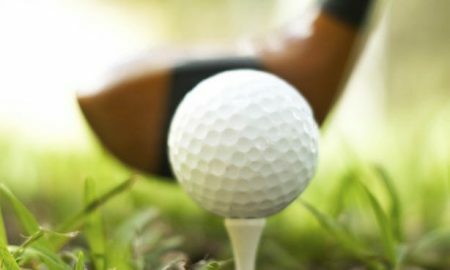 The Eaglequest Golf Dome’s timed practice sessions invite golfers to hit as many balls as they please while honing their form in an indoor, climate-controlled driving range. An indoor practice green also lets players focus on their short games. Groupon.com is having a huge Sitewide Sale. Save up to an extra 20% off. 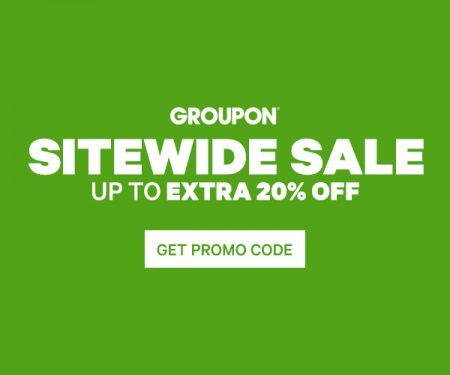 Save an incredible extra 20% off Local deals on Groupon when you enter the promotion code SALE3 at checkout! I’ve tested the code and can verify that it works. The code is valid on up to 3 local deals per customer. This promo code is valid for 2-days from Friday, May 19th to Saturday, May 20, 2017. This is a very popular offer so don’t miss out! The promo code works on most local deal in Canada or U.S. (Ie. golf, restaurants, things to do, spas, events & activities, heath & beauty, automotive, home, etc…). Valid on 1 unit per transaction; max 3 uses per customer. Max $50 discount per deal. Must click through to be eligible. Must use mobile or desktop site. This promo code is valid for 2-days only from Saturday, April 29 to Sunday, April 30, 2017 at 11:59pm EST. Valid on 1 unit per transaction; max 3 uses per customer. This is a hot deal! Most deals on Groupon is already discounted 50-90% off. You’ll find lots of amazing deals with the extra up to 30% off (sale on sale). This is going to be a very popular offer so don’t miss out! 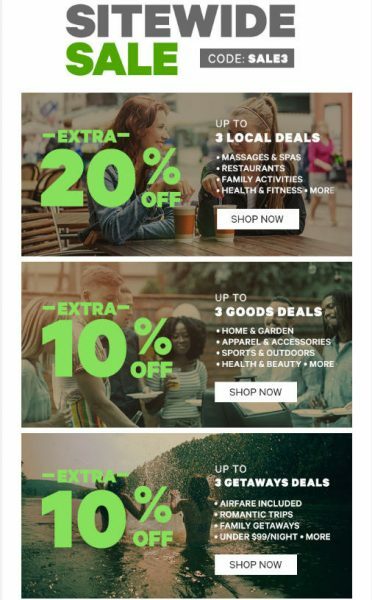 Groupon.com is offering an extra 20% off promo code today. Save an incredible extra 20% off local deals on Groupon when you enter the promo code SMILE20 at checkout. I’ve tested the code and can verify that it works. This promo code is valid for 2-days only from Thursday, April 20th to Friday, April 21, 2017 at 11:59pm PDT. This is going to be a very popular offer so don’t miss out! This promo code is valid for 3-days from Tuesday, April 11 – Thursday, April 13, 2017. This is a very popular offer so don’t miss out! Groupon.com is having a huge Sitewide Sale today. Save up to an extra 20% off! This promo code is valid for 1-day only today (Wednesday, March 29, 2017) until 11:59pm PDT. This is a very popular offer so don’t miss out! The promo code works on most local deals in any city in Canada or U.S. (Ie. 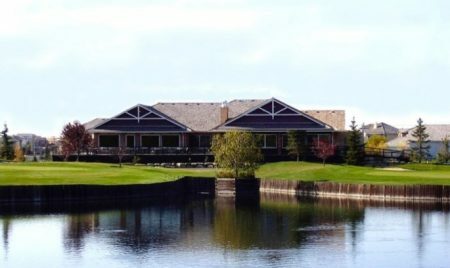 golf, restaurants, spas, events & activities, heath & beauty, automotive, home, etc…). Valid on 1 unit per transaction; max 3 Local deals, 3 Getaways flash deals & 3 Goods items per customer. Up to $50 discount per deal. Groupon.com is having a huge Sitewide Sale! Save up to an extra 20% off! This promo code is valid for 3-days only from Wednesday, August 3 to Friday, August 5, 2016 at 11:59pm PDT. This is going to be a very popular offer so don’t miss out! Groupon.com is offering a promo code that’ll save you up to an extra 25% off! 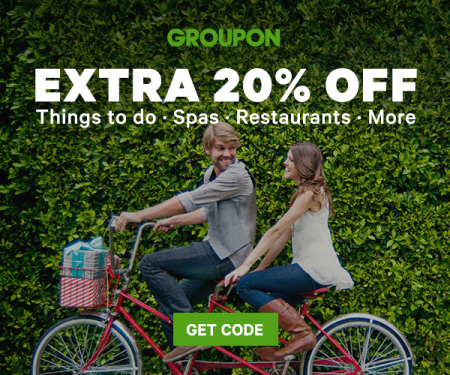 This is only the 3rd time I’ve seen Groupon offer a code like this so take advantage of it while it lasts. 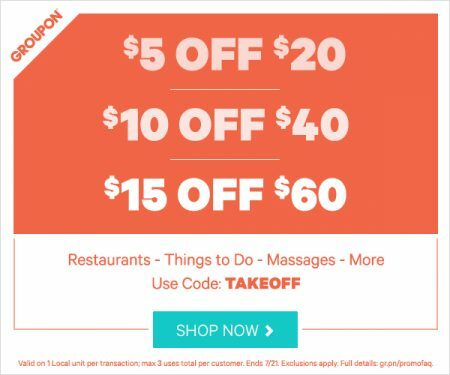 Save up to an extra $15 off deals on Groupon when you enter the promotion code TAKEOFF at checkout! This promo code is valid for 2-days only from July 20-21, 2016. This is going to be a very popular offer so don’t miss out! This is a HOT DEAL! 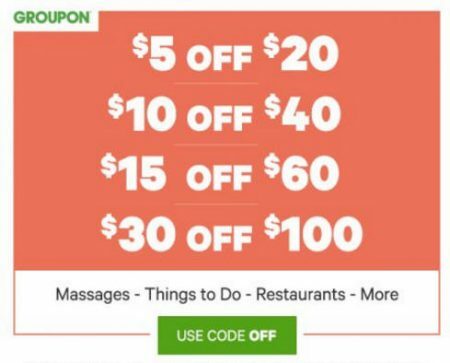 Most deals on Groupon is already discounted 50-90% off. You’ll find lots of amazing deals with the extra up to 25% off (sale on sale). The code is valid on 1 Local unit per transaction, max 3 uses total per customer. I used the code to buy a couple deals and can verify that it works. The code is valid on a single deal per transaction so you’ll need to purchase each deal individually. 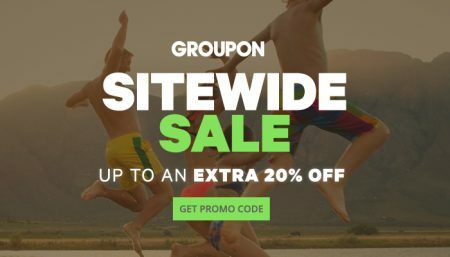 Groupon.com is having a Sitewide Sale! Save up to an extra 20% off! This promo code is valid for 2-days only from Tuesday, July 12 – Wednesday, July 13, 2016 at 11:59pm PDT. This is going to be a very popular offer so don’t miss out! The promo code works on any local deal in any city in Canada or U.S. (Ie. restaurants, spas, events & activities, heath & beauty, automotive, home, golf, etc…). Valid on 1 unit per transaction; max 3 Local deals, 3 Getaways flash deals & 3 Goods items per customer. Up to $50 discount per deal.